Luxury hotel in Trinidad. The IBEROSTAR Grand Hotel Trinidad opens the door to a world of maximum comfort in the centre of Trinidad. Offering premium five-star services, our luxury hotel in Cuba is a travel experience in its own right and a destination in itself for tourists coming to the island. 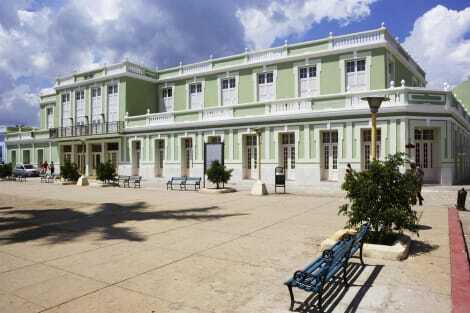 Colonial treasure in Cuba. Drawing inspiration from traditional colonial architecture, the IBEROSTAR Grand Hotel Trinidad brings guests back to sixteenth-century Cuba. Fine interior design, noble materials and premium services make this hotel one of the most charming in Trinidad. Five-star suites in Trinidad. Relaxation, comfort and history get together in the rooms and junior suites of the IBEROSTAR Grand Hotel Trinidad. Luxury accommodation in the heart of the city, peace and quiet guaranteed. Get great amenities and services in these exclusive rooms. Tasty Cuban food. Enjoy exquisite Cuban food in the restaurants of the Grand Hotel Trinidad, a veritable gourmet experience in the Caribbean. Both in the buffet restaurant and in the gourmet space, you will find all the flavours, freshness and passion that characterise traditional Cuban recipes. Hotel close to Ancón beach. The IBEROSTAR Grand Hotel Trinidad is a charming city hotel in the centre of Trinidad, but it is so close to the beach that it takes very little time to get to it. On Ancón beach, only 13km away, you will swim in crystal-clear waters and breathe in the sea breeze in a lovely setting. lastminute.com has a fantastic range of hotels in Trinidad, with everything from cheap hotels to luxurious five star accommodation available. We like to live up to our last minute name so remember you can book any one of our excellent Trinidad hotels up until midnight and stay the same night.